The East coast of Australia got smashed by a “low” on the weekend. For all intents and purposes this was a tropical cyclone, except Sydney’s below the Tropic of Capricorn and the barometric pressure didn’t reach the required minimum. The “East Coast Low” behaved like a cyclone though – high, screaming winds, torrential rain and huge seas. Ultimately a big cause of damage was a coincidental King Tide which meant the coast got absolutely pounded. 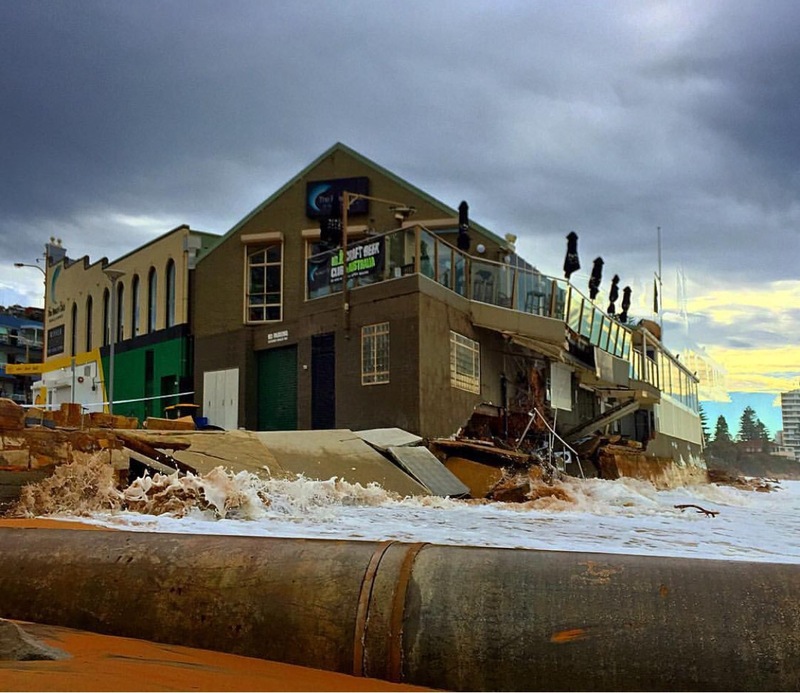 A high profile casualty of the “East Coast Low” was the Northern Beaches best craft beer venue – The Beach Club Collaroy. As you can see from the above photo, the balcony which provides Sydney finest view with a crafty has collapsed. Much of the beach over which the club’s balcony and bistro looked has disappeared. Early days for the Club – but hopefully the damage is repairable and they’ll be serving crafties again soon. Photo credit: One of the best Instagram accounts of Nothern Beaches imagery (including some damn fine photos from the ferry) is @ihaig72. Have a look at it as well as @BackoftheFerry. Check out the Beach Club’s Instagram account for updates. There is structural damage (exacerbated with last night’s tide) – so it could be awhile between crafties.